Many events that have changed the course of Earth’s history have been lost to time. But some very special things have survived, and we’re learning from them every day. The latest prehistoric find is two tiny feathered wings preserved in Burmese amber. An analysis of the wings was recently published in the journal Nature Communications. 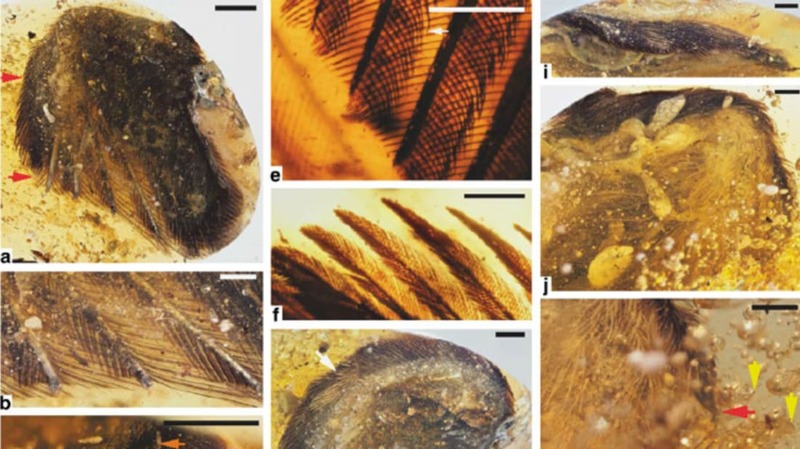 Scientists have found individual feathers before, pressed into fossils and suspended in amber. While this fact is, in itself, impressive, there’s a limit to how much information we can draw from these specimens. The imprint of a feather can’t tell us much about color, and absent any other evidence, a feather separated from its owner can be hard to place in context. Feathers play a big role in the evolution of life on our planet. We know now that most, if not all, dinosaurs were feathered, and their avian descendants certainly are. But what happened in between is still a little murky. So when researchers found two beautifully preserved prehistoric wings inside small drops of amber, they were excited. They’d purchased the amber at a market in the Kachin state, Myanmar, a region that has become known among paleontologists for the richness of its preserved specimens. David Grimaldi is a curator of invertebrate zoology at the American Museum of Natural History. “About 70 percent of the Burmese amber is barren, but the other 30 percent features phenomenal biodiversity,” Grimaldi told National Geographic. The amber specimens containing the wings are very small; one is less than an inch long, the other just under 2 inches. Nestled inside each is a delicate, feathery wing, complete with skin, claws, muscle, and feather shafts. Co-author Ryan McKellar is curator of invertebrate palaeontology at Canada's Royal Saskatchewan Museum. "The biggest problem we face with feathers in amber is that we usually get small fragments or isolated feathers, and we’re never quite sure who produced [them]," he said. "We don’t get something like this. It’s mind-blowingly cool." They also discovered that these wings are 100 million years old. After removing the pieces and analyzing them, the researchers concluded that they likely belonged to two juveniles from a group of protobirds called enantiornithes.